Axel Berndt studied computer science and music at the Otto-von-Guericke University in Magdeburg. From 2006 on, he did research and teaching in music informatics at the Department of Simulation and Graphics and got his PhD in 2011. 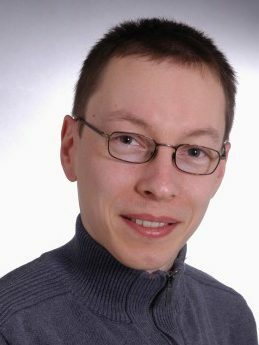 From 2012 to 2015, he worked at Technische Universität Dresden, Faculty of Computer Science. 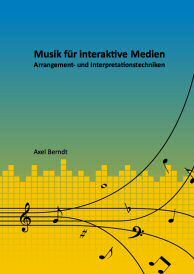 Since April 2015 Axel Berndt is a member of the CeMFI and the competence center “Music – Edition – Media”. His research interests are musical human-computer interaction, interactive media scoring, interactive and adaptive music, new musical interfaces, expressive performance, generative music, auditory displays, and auditory user interfaces. Dresden, Germany, September 2015, TUDpress. in Ambient@4, Huddersfield, UK, 2018.
in Proc. of the 2nd AES Workshop on Intelligent Music Production, London, UK, 2016.
in Proc. of the Int. Computer Music Conf. (ICMC), Utrecht, The Netherlands, 2016.
in Proc. of the 17th Int. Society for Music Information Retrieval Conf. (ISMIR) 2016, New York, NY, USA, 2016.
in DHd 2016: Modellierung — Vernetzung — Visualisierung: Die Digital Humanities als fachübergreifendes Forschungsparadigma, Leipzig, Germany, 2016.
in "Ei, dem alten Herrn zoll’ ich Achtung gern’" Festschrift für Joachim Veit zum 60. Geburtstag, K. Richts and P. Stadler, Eds., Munich, Germany: Allitera Verlag, 2016, pp. 141-163.
in Musikpsychologie — Anwendungsorientierte Forschung, W. Auhagen, C. Bullerjahn, and R. von Georgi, Eds., Göttingen, Germany: Hogrefe Verlag, 2015, pp. 254-262.
in Audio Mostly 2015: 10th Conf. on Interaction with Sound—Sound, Semantics and Social Interaction, Thessaloniki, Greece, 2015.
in Works in Audio and Music Technology, A. Berndt, Ed., Dresden, Germany: TUDpress, 2015, pp. 155-170.
in Mensch und Computer: Workshop für Innovative Computerbasierte Musikinterfaces, Stuttgart, Germany, 2015, pp. 247-252.
in Works in Audio and Music Technology, A. Berndt, Ed., Dresden, Germany: TUDpress, 2015, pp. 129-153.
in Works in Audio and Music Technology, A. Berndt, Ed., Dresden, Germany: TUDpress, 2015, pp. 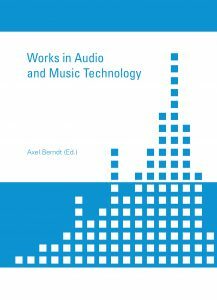 1-30.
in Works in Audio and Music Technology, A. Berndt, Ed., Dresden, Germany: TUDpress, 2015, pp. 97-128.
in Works in Audio and Music Technology, A. Berndt, Ed., Dresden, Germany: TUDpress, 2015, pp. 31-57.
in Works in Audio and Music Technology, A. Berndt, Ed., Dresden, Germany: TUDpress, 2015, pp. 59-95.
in 12th Sound and Music Computing Conf. (SMC15), Maynooth, Ireland, 2015.
in Audio Mostly 2014: 9th Conf. on Interaction with Sound—Imagining Sound and Music, Aalborg, Denmark, 2014.
in Jahrbuch immersiver Medien 2014: Klänge, Musik und Soundscapes, Institut für immersive Medien, Ed., Fachhochschule Kiel, Germany: Schüren Verlag, 2014, pp. 95-105.
in Proc. of New Interfaces for Musical Expression (NIME) 2014, London, UK, 2014, pp. 323-326.
in Audio Mostly 2013: 8th Conf. on Interaction with Sound—Sound for Information and Intuition, Piteå, Sweden, 2013.
in HCI International 2013—Posters’ Extended Abstracts, Las Vegas, Nevada, 2013, pp. 484-488.
in Kieler Beiträge zur Filmmusikforschung, vol. 9, pp. 293-323, 2013.
in Proc. of the Int. Computer Music Conf. (ICMC), Ljubljana, Slovenia, 2012, pp. 412-415.
in Audio Mostly 2012: 6th Conf. on Interaction with Sound—Sound and Future Vision, Corfu, Greece, 2012, pp. 61-67.
in Audio Mostly 2011: 6th Conf. on Interaction with Sound—Sound and Context, Coimbra, Portugal, 2011, pp. 75-81.
in Proc. of the Int. Computer Music Conf. (ICMC), Huddersfield, UK, 2011, pp. 118-121.
in Proc. of New Interfaces for Musical Expression (NIME) 2011, Oslo, Norway, 2011, pp. 48-51.
in Game Sound Technology and Player Interaction: Concepts and Developments, M. Grimshaw, Ed., Hershey, PA: IGI Global, 2011, pp. 60-76. A. Berndt, , Munich, Germany: Verlag Dr. Hut, 2011.
in Proc. of the 3rd Int. Conf. of Students of Systematic Musicology (SysMus10), Cambridge, UK, 2010.
in Proc. of the Int. Computer Music Conf. (ICMC), New York, USA, 2010, pp. 381-388.
in Proc. of New Interfaces for Musical Expression (NIME) 2010, Sydney, Australia, 2010, pp. 277-282.
in Audio Mostly 2009: 4th Conf. on Interaction with Sound—Sound and Emotion, Glasgow, Scotland, 2009, pp. 9-16.
in Proc. of the Int. Computer Music Conf. (ICMC), Montréal, Canada, 2009, pp. 355-358.
in Audio Mostly 2008: 3rd Conf. on Interaction with Sound, Piteå, Sweden, 2008, pp. 72-79.
in Audio Mostly 2007: 2nd Conf. on Interaction with Sound, Ilmenau, Germany, 2007, pp. 141-147.
in Conf. on Interdisciplinary Musicology 2007 (CIM07), Tallinn, Estonia, 2007.
in Audio Mostly 2006: A Conf. on Sound in Games, Piteå, Sweden, 2006, pp. 53-59. Diploma thesis, Otto-von-Guericke University, Department of Simulation and Graphics, Magdeburg, Germany, 2006.
in Simulation und Visualisierung (SimVis), Magdeburg, Germany, 2003, pp. 129-138. Based on our investigations and model development work in the field of expressive music performance we are defining a descriptions format called Music Performance Markup (MPM). It is XML based. We will also develop a whole infrastructure of documentations, guidelines, sample encodings and software tools around it. In the course of the Center “Music – Edition – Media” we develop tools for and new approaches to digital music editions. This comprises converters, audio-to-score alignment services, pen and touch interfaces for the annotation of autographs, file format developments and more. Development of Music Information Retrieval techniques to support musicology and digital music edition. With Vocalmetrics [1, 2] we, furthermore, provide a visualization and interaction tool for musicological work with large music databases. It supports database analysis with visual analytics techniques. Maintenance and the insertion of new datasets is supported by metapher-driven interactive rating techniques. Free-hand input for controlling expressive music parameters, pen-and-touch interactive scores for different stages of classical music production. In-depth analyses of phenomena of expressive music performance (timing, dynamics, articulation), the development of mathematical models to emulate these phenomena and their implementation to render expressive MIDI sequences. Techniques for the musical scoring of interactive media, dynamic music, that is able to react on interaction, i.e. changes in the interactive narrative, seamlessly and without unmusical cuts and breaks. Experiments with a whole bandwidth of algorithmic music generation techniques, always connected to direct and/or indirect user interaction even during playback. Development of Auditory Display techniques for several application contexts. The sonification of motion data and mid-air gestures (tracked from Microsoft Kinect) support user interaction. The generation of urban soundscapes aid urban development and planning (in collaboration with Fraunhofer IFF Magdeburg). A series of studies on navigation via sound mdulations, we called these sounds Auditory Pointers, resulted in the development of a prototype Android app. I contributed to the development of a new interdisciplinary Masters study course at Ostwestfalen-Lippe University of Applied Sciences and University of Music Detmold. It involves the fields media production, audiovisual arts and computer science. I was, furthermore, involved in a project that brought together Technische Universität Dresden, Dresden University of Applied Sciences (Hochschule für Technik und Wirtschaft Dresden) and Dresden University of Fine Arts (Hochschule für Bildende Künste Dresden). In this project we explored possibilities for shared interdisciplinary studies. In this project we developed interaction and visualization approaches to support the efficiency and effectiveness of different meeting and planning scenarios in business companies. Diploma thesis, Technische Universität Dresden, Faculty of Computer Science, Dresden, Germany, 2015.
in cooperation with MAGIX Software GmbH. Diploma thesis, Technische Universität Dresden, Faculty of Computer Science, Dresden, Germany, 2014.
student research project, Technische Universität Dresden, Faculty of Computer Science, Dresden Germany, 2014. Bachelor thesis, Technische Universität Dresden, Faculty of Computer Science, Dresden, Germany, 2014.
awarded at MIDI HACK Stockholm, Sweden, May 2014.
student research project, Technische Universität Dresden, Faculty of Computer Science, Dreden, Germany, 2013.
in collaboration with University of Music Franz Liszt Weimar. Diploma thesis, Technische Universität Dresden, Faculty of Computer Science, Dreden, Germany, 2013. Diploma thesis, Technische Universität Dresden, Faculty of Computer Science, Dresden, Germany, 2013.
student research project, Technische Universität Dresden, Faculty of Computer Science, Dresden, Germany, 2013. Bachelor thesis, Otto-von-Guericke University of Magdeburg, Faculty of Computer Science, Magdeburg, Germany, 2010.
student research project, Otto-von-Guericke University of Magdeburg, Faculty of Computer Science, Magdeburg, Germany, 2010. Diploma thesis, Otto-von-Guericke University of Magdeburg, Faculty of Computer Science, Magdeburg, Germany, 2007.
in Musik aus Mitteldeutschland, Munich, Germany: Strube Verlag, 2012. A. Berndt, , 2nd ed., Halberstadt, Germany: Musikverlag Bruno Uetz, 2008.
in CEBIT 2018 panel discussion, Hannover, Germany, 2018.
in Aufführung und Edition 2018, 17. Int. Tagung der Arbeitsgemeinschaft für germanistische Edition, Frankfurt am Main, Germany, 2018. Der Computer als Komponist und Interpret der Zukunft?